Somewhere in Turin or Auburn Hills or wherever, Sergio Marchionne said the words, "See, I told you so," this week. This must have happened based on recent orders received for Maseratis. We all laughed when it was announced Maserati wants to increase sales to 50,000 cars a year by 2015 when it had only sold about 6,000 in all of 2012. 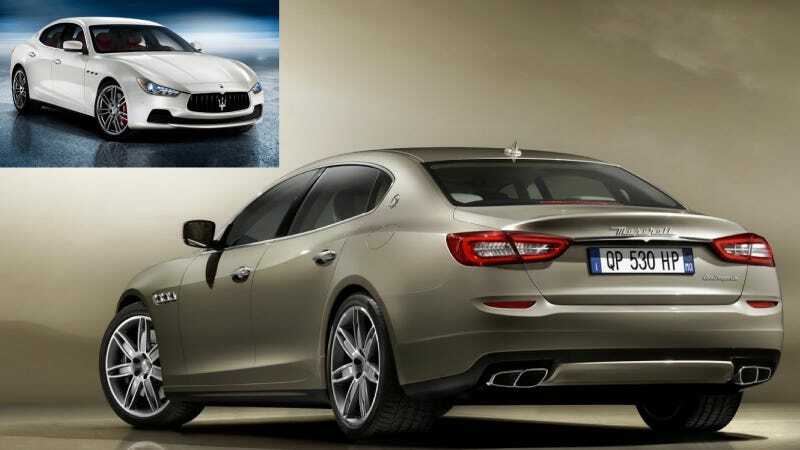 But thanks to the new Maserati Quattroporte going on sale earlier this year, and the new Ghibli going on sale this fall, the Italian brand run by Fiat looks a lot closer to reaching that goal. Bloomberg reported on Wednesday that Maserati orders reached about 17,000 in the first half of 2013 – more than double for the whole of last year. It's a great sign for a long-neglected branch of the Fiat empire, one that now appears to be boosted by China. Maserati's Harald Wester told Bloomberg that the Quattroporte's sales rise has been driven by Chinese demand, probably thanks to it being noticeably larger inside and outside than its predecessor. Now it's fair to say that the Ghibli, which is cheaper than the Quattroporte and will offer a diesel to CO2-stringent markets, could significantly boost sales in the way its big brother has. Which is fine, no matter what you think of Maserati's current strategy of going bigger, cheaper and (soon) more SUV-ish. The Ghibli may not have a supercar profile, but it's a neat package against a BMW M5 or Jaguar XFR. Say what you will about the new QP (I'll say it looks a little fat, but still nice), but the people with the checkbooks have spoken. Now the Levante SUV still sounds silly, but as Porsche fans now say, as long as it saves the sports cars.